This year, the Pentagon’s advanced research projects department will start testing their new “submarine” drone, which can lie in wait on the ocean floor for years before ever being launched into the skies. The new drones, being developed by the Defense Advanced Research Projects Agency (DARPA), are part of a new focus by the US military in developing and improving technology for emerging threats. 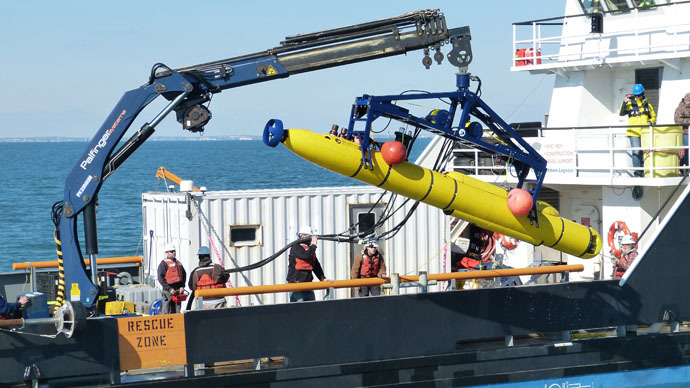 These deployable, unmanned systems and sensors can theoretically lie on the deep-ocean floor for years at time in anticipation of the US Navy’s need for non-lethal assistance. When needed, the deep-sea nodes can be activated remotely and recalled to the surface. DARPA will specifically be testing whether the drones can survive for years under extreme pressure before being triggered from a distance, and whether they can rise through a water column and relay information. The tests are part of DARPA’s two phases under its Upward Falling Payloads (UFP) program. The UFP’s would be equipped with electronic and low-power laser attack capabilities, surveillance sensors, and airborne and aquatic drones that would have the ability to act as decoys or offer intelligence and targeting data. Much of the testing will be done in the Western Pacific. Nearly 50 percent of the world’s oceans are deeper than 2.5 miles (4km), which provides areas of concealment and storage so assets can remain undetected for long periods of time and still be recalled when needed. The vastness also allows for simultaneous operation across great distances. The US Navy already uses ocean-faring drones called Slocum Gliders to scan the sea and transmit information – mostly weather and surveillance data – to ships. These drones don’t need fuel to operate, but use ocean currents for propulsion and buoyancy to shift direction. DARPA released a biennial report last week summarizing its evolving focus to maintain America’s strategic position in the world. DARPA is seeking a 59 percent increase in the UFP budget, from $11.9 million to 19 million, it was reported in March. But overall, President Barack Obama requested a $3 billion budget for DARPA for the fiscal year 2016, a slight increase over previous years. This would enable the agency to carry out ambitious project in four areas outlined in its biennial report – Rethink Complex Military Systems; Master the Information Explosion; Harness Biology as Technology; and Expand the Technological Frontier.